YANGON — Myanmar, particularly around the highlands of southern Shan State with its perfect topography and climate, could be a globally important coffee growing region with the potential to produce some of the world’s best quality beans. Though coffee has long been grown in Myanmar, crops are normally of low quality and have generally been exported and used in low-grade products such as 3-in-1 sachet mixes. Recent years have seen a small sprouting of coffee producers who are working to produce high-quality and organic strains of coffee beans. Genius Shan Highlands Coffee, for example, won an ASEAN Business Award in the Sustainable Social Enterprise category in 2018. Gentleman Coffee Roasters, from the same minds behind Yangon’s Easy café, works with farmers to grow specialty-grade coffee and has impressive traceability practices. With an overall aim of alleviating poverty, Winrock International, with support from USAID, has since 2014 been helping smallholder coffee producers in Myanmar earn a fair price for their coffee by modernizing their practices, improving their market connections and getting the private sector on board. This is where Sawbwa comes in. Sawbwa is a startup coffee company focusing on sourcing and selling the highest quality of coffee available in Myanmar and on helping farmers to increase the quality of their bean as part of a movement swapping poppy crops for coffee plants. It was founded in early 2017 by two U.K. natives, Sam Foot and Jason Brown, with a longtime interest in Myanmar and a love of specialty coffee. In 2018, experts from the Specialty Coffee Association, an American member-based nonprofit coffee association, came to southern Shan and tested the harvest of the Ban Sawk coffee farm. Rating, or cupping, coffee involves taking meticulous measures to see where it stands on a scale of 0 to 100. Coffee reaching a grade of 60 to 80 qualifies as commercial grade while specialty coffee must be rated above 80. For coffee to be rated specialty grade, its taste profile must be unique and stand out from commercial grade coffee. The Specialty Coffee Association rated it the second highest quality of coffee produced in Myanmar at 88 to 89, which also puts it among the best in the world. Sawbwa bought a majority of Ban Sawk’s harvest and decided to invest in the farm with a view to giving the farmers the power to produce more of the same quality next year. Ban Sawk is in an area where farmers traditionally depended on the opium crop for a living. 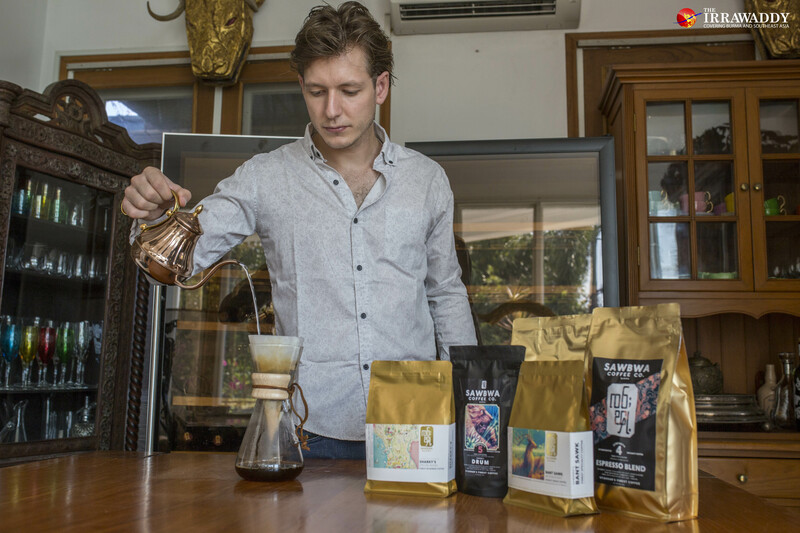 “We think next year it will be the highest-rated coffee in Myanmar,” said Sam Foot, one of Sawbwa’s co-founders who studied politics and law in the UK and dropped a job as a financial analyst in order to establish the company. Sam and Sawbwa’s other founder, Jason Brown, started out roasting the coffee beans in a 1-kilogram roaster hooked up to a laptop in the garage of Jason’s relative’s house. As the bean is roasted under gas in a barrel, different chemical charges happen to it. The flavor and color transform from a grassy green to sweeter brown. The laptop helps them keep track of the temperature, which has to rise gradually. Specialty coffee must be roasted exactly the right amount in order to bring out the unique flavors of the bean, which can vary between regions and even farms. “Specialty coffee has to be roasted very, very meticulously. Unlike large coffee companies which mass produce more standardized products, specialty coffee roasters pay greater attention to each roast cycle, which takes between eight and 15 minutes,” said Sam. 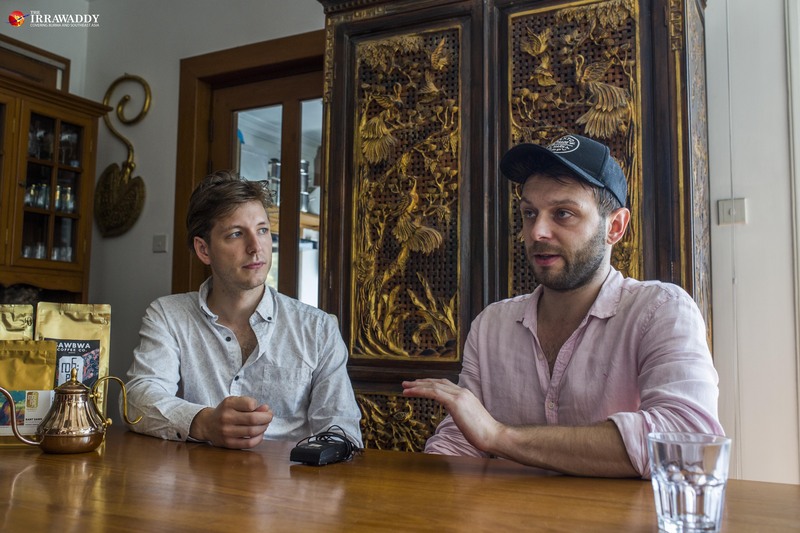 The two had lived in Myanmar previously and found themselves back in London with jobs and a life they found “rather dull.” Inspired by a friend who had started a craft beer company, they moved back to Yangon and launched the company with their own money. Though this is still only an emerging coffee company, major players in Myanmar’s food and beverage industry are already snapping up packs of Sawbwa to serve their customers, including the Pegu Club, the 57 Below group of restaurants, Sharky’s restaurants and delis and outlets by Pun Projects. Packs are also sold on the Yangon Door2Door website, at Yangon International Airport and Promart supermarkets. “Yangon is so receptive and ready for new and experimental ideas,” said Sam. Jason, also a U.K. native, had worked as a programmer and always knew he wanted to have his own business. “When the opportunity to do this came up, there wasn’t even a question about it. I thought ‘Holy s–t, if I can do this, that would be super cool,’” he said. Packs of Sawbwa coffee are priced at between 5,000 kyats ($3.32) and $15. The classic espresso blend, Drum, has “sweet chocolate notes,” and they also produce an artisan espresso called Harp. Both names reference the traditional Burmese instruments. Yay Chan Pyin and Pway Na Phar are their light and medium roast blends, named after the villages in southern Shan where the coffees are grown. Sawbwa has worked with both Sharky’s and the Pegu Club to create their own unique blends of coffee to be served and sold exclusively at their respective locations. This is a product for people who appreciate a very fine coffee product, and the playing grounds of Yangon’s growing middle class appear to be the perfect place to start pushing the product. It’s for those who revel in experiencing the best food or drink available, who treat themselves to that premium cut of meat or cheese or wine and truly savor it. Sam and Jason say that since they started the company, they’ve been working 12-hour days with no days off and attend most food events and festivals in order to get the Sawbwa name out there. Profits are only starting to roll in now. 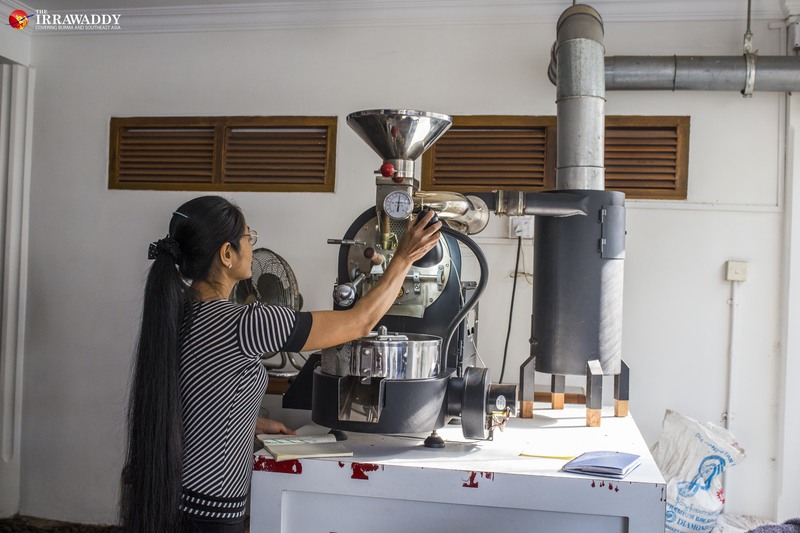 Their next move is to establish a larger roasting facility on Yangon’s outskirts, in Shwepyithar, and increase output from 1 kg per roast to 15 kg — still relatively little in order to keep quality high. “We want to position ourselves as Myanmar’s ambassadors of coffee so we will find the markets overseas. We want to be the guys to come to for specialty coffee from Myanmar,” said Jason. For now, the Sawbwa guys can be seen flaunting their caffeine kicks — in both traditional form and as exciting coffee cocktails — around Yangon’s growing boutique market scene.